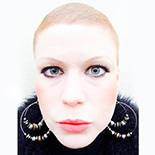 I'm Jojogingerhead, a 31 year old artist & musician based in Brighton (UK) satirically documenting the highs and lows of my secondary triple negative breast cancer diagnosis. Trying to see the light in a dark and scary situation without using the words fight, battle, journey or survivor. Ketchup or mustard from the chemo trolly? Went to put on a headscarf this morning and it appeared that a spider was using it as a home to lay her eggs in! Goodbye sleep, hello steroid induced mania! Kerrie on Dating with disease, swipe left or right? © 2014 The Malignant Ginger. All Rights Reserved.